I’m embedding this interview with Dr. Herold Weiss, author of Meditations on the Letters of Paul, as it provides some background for understanding some of the discussion of the terminology that I’m doing right now in working through Paul. I find it very helpful in clarifying the issues. I commend to my readers my interview last night with Bob MacDonald regarding his newly released book The Song in the Night. I make some further remarks on the Energion Discussion Network. A second law and a second note on introductions to biblical books. Goes together, no? I completed my reading of Numbers along with the Cornerstone Biblical Commentary yesterday and today read the introduction from the section on Deuteronomy. In it the author, Eugene H. Merrill (professor at Dallas Theological Seminary) argues forcefully for Mosaic authorship and for an early (1446 BC) date for the exodus. In school I learned 1445, but the majority position is that the exodus occurred in the mid to late 13th century, and critical scholars in general would reject at least direct Mosaic authorship in favor of a date of writing in the 7th century BC. In the course of presenting these positions and his basis for them he makes the statement (p. 449) that “there is absolutely no objective evidence that compels a late provenance for the book.” I would first point out that it is useful to realize that evidence rarely compels, especially in historical situations such as this. Secondly, there is evidence that would point to the composite nature of the book and some that would suggest a later historical setting. Certain Merrill, along with many others, has provided explanations for this apparent evidence, but having provided an alternate explanation, however convincing it may be to the one providing it, does not make the evidence go away. I like to look at introductions in various study Bibles. I’m not sure why, as the usual result is simply to raise my blood pressure a bit. In this case I have at hand The Oxford Study Bible, The Jewish Study Bible, The New Interpreter’s Study Bible, and the NLT Study Bible. Out of these, only the NLT Study Bible would tend to agree with Merrill. That count is not important, however, because it doesn’t constitute a good survey of quality scholarship on the issue. The problem with the lot of these is that they each assert their position with confidence and provide a couple of notes on things that favor that position, but give very few reasons why anyone might disagree. 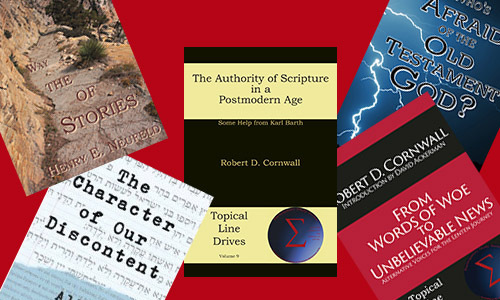 If you read the conservative introductions, you might well conclude that the critical scholars who disagree are just perverse, while if you read the more critical introductions, you might not be aware that there are modern conservative scholars who would hold to such views as a 1446 BC date for the exodus or Mosaic authorship of Deuteronomy around 1406 BCE. You may think I’m being unfair, as each introduction must be short, especially in the study Bibles. Merrill’s can be somewhat longer as he is writing for a substantial commentary on just three books of the Bible. But my point is not to chastise the scholars for their positions or for espousing them in their introductions. I do find their language a bit intemperate, and I would also point out that it doesn’t take many words to indicate that other scholars disagree with at least some indication of why that might be. My interest is in what you do about it. I’d suggest strongly that you don’t surround yourself with books that agree with you and that come from scholars that are in your own religious/denominational tradition. I am generally convinced, though I wouldn’t use “compelling” for any evidence, that the Pentateuch, including Deuteronomy, is a composite text containing some ancient traditions, but built up with case law and later additions and adaptations. Yet I will carefully read Merrill’s commentary as I also read through the Hebrew text. What’s more, I can predict right now that I will learn a great deal from Merrill’s work. So to a man is a voice praising him (Prov. 27:21). I really need to read someone saying that there is “no compelling evidence” for the position I hold. If I only read The Oxford Study Bible, The Jewish Study Bible, and The New Interpreter’s Study Bible, I would never be pushed to look more closely at the evidence. I think it is particularly important in using study Bibles, because people seem to get the idea that whatever is in the notes is what “scholars” believe regarding the passage. They often also decide that if “scholars” believe it, then they must too. But scholars as a group rarely agree on anything. It’s one of their best features, because they all want to refine things and find some new, good ideas. The results are sometimes crazy, but nothing like as bad as the results of not doing so. Introductions are hard to write and often don’t prove that useful. But using a range of them can be quite enlightening! Since I wrote recently about biblical culture shock, and have also commented from time to time on our impatience with the process in politics, it was interesting for me to come to Numbers 30 and 31 in my evening reading. Numbers 30 is a sort of kinder, gentler sort of culture shock. It’s about vows in general, and more particularly about women and vows. When can “a woman’s man” abrogate her vow. If you read this passage negatively, there’s a certain sense that a woman needs to be protected from rash vows by a sensible man, whether by her father or her husband. Underlying that is a much more robust view of the sacredness of the vow in the first place. Promises are somewhat weaker in our modern society, so we really have two levels of culture (at least) in this passage to get past. The first is the idea that a rash vow to do something stupid would actually be binding. I think our modern view would be that if it’s rash and stupid, don’t do it, and God will forgive you. If it’s a verbal agreement with someone else, we still might wiggle out. Even if it’s in writing, we’ll probably try. But those “outs” are not permitted by the text. So once we’ve gotten past that, we have the next issue which is the subjection of the women to men in what is clearly a serious spiritual issue. There is an assumption underlying this passage that the responsible spiritual decision maker in the home is a man, whether the father or the husband. It is on his action that the result is based. So we’re going to find some variety among Christians today in how they might relate to the relationship between men and women reflected in this passage, as well as to the general idea of a vow. I would suggest that, contrary to Alden’s chapter title (as much as I like it), the next chapter in Numbers may be the worst story in the Old Testament. Numbers 31 is pretty dismal. Those who might call Christianity or Judaism violent religions might well cite a passage like this one. And herein lies the question of interpretation. We find it easy to bypass or ignore a passage like Numbers 31. You’ll find very few Christians who believe that the behavior of the Israelites, even though it is presented as divine command, is something we would apply today. We’ll have various reasons for doing so, and in looking at how we apply this passage, we can discover a great deal about how we interpret scripture. Think about how you do it. Then compare how you respond to Number 31 with how you responded to Numbers 30. Are the two approaches the same? Or do you have a sort of ad hoc explanation which comes out with a result you “know” is right, but which cannot be applied universally? I’d suggest that we need to consider our method of biblical interpretation carefully and ask whether the same method works everywhere. I wrote something about Numbers 31 for the spring issue of Sharing the Practice. You can find that article online, Preaching an Unpreachable Passage. In September of 2013 I published a book titled The Authorship of Hebrews: The Case for Paul by David Alan Black. It has been interesting to read material on this topic since. I would note that while I believe Dave’s case is well presented, and was convinced by it to give more room to the idea of Pauline authorship, I have not been convinced to abandon my agnosticism on the authorship of Hebrews. Today my attention was drawn to two more posts. The first is by Dave Black, which I copied to the Topical Line Drives site to create a permanent link (Dave’s blog doesn’t support this). It’s a short comment, but makes clear Dave’s view that Hebrews is not so anonymous as one might think. The second post is by Kyle O’Neill (HT: Thomas Hudgins), who favors Apollos or Aquilla and Priscilla. There is a broad consensus among scholars that Paul did not write the book of Hebrews. There is no similar consensus about who did write the book. There’s an easy explanation, however, for the difference between these positions. It’s simply the view of the authors in question of the external evidence. Is the testimony of the early church fathers reliable on matters of authorship? While there are some disagreements about precisely what each church father said (Dave Black provides his own translations of many of these references in his book), in general if one is prepared to accept the testimony of the early church fathers, one is likely to accept Paul as the author of Hebrews. On the other hand, if one favors internal evidence over this external testimony, one likely will not favor Paul. Note that I do not mean here a simple differentiation between how one favors internal over external evidence, such as one might have in textual criticism. In this case, we’re looking at specific testimony with specific issues. How much could each witness have known? To what extent are they reporting hearsay? To what extent might they be trying to shore up the claim of Hebrews to be scripture? So one can have a general position favoring external evidence on many other topics, but nonetheless not have the same emphasis with regard to authorship. In my view, if we did not have the testimony of the early church fathers, nobody (or almost nobody) would assign Hebrews to Paul based on the internal evidence. But I also believe that if you don’t accept the testimony of the early church fathers on this point, there is no basis to claim any particular author for the book. The problem with determining authorship based on internal evidence is that you must have a body of material with known authorship with which to compare the book. Of the proposed authors of the book of Hebrews, only three have a significant body of written material, Luke, Paul, and Clement. For others, such as Apollos or Aquilla and Priscilla, we have no written material, and precious little biographical information. It is always possible that one of these many candidates wrote the book, but the evidence just isn’t there. That’s why, having decided that there is enough internal evidence in the book to question Paul’s authorship, I do not propose an alternative. I don’t know who wrote it. I realize there are answers to the difficulties with Pauline authorship, but in my view it seems that there’s just a bit too much to explain away. It could be Paul, but then again, not so much. It’s interesting how strong the consensus against Pauline authorship has become. I would think that there would be a greater body of argument in favor of the testimony of the early church fathers. A very slight swing in favor of that testimony would probably shake the consensus quite substantially.